On 14th September, social media marketing expert Rosalind Davis is joining us for a full-day seminar on how to create strategies and content that can increase engagement and drive business and loyalty. Rosalind is an artist-curator and a graduate of The Royal College of Art and Chelsea College of Art. As a social media marketing expert and consultant Davis has worked for arts organisations, charities and independents as well as corporations such as BBC4 and E4 and delivers short courses in social media marketing and arts management at UAL focusing on creative strategies, analysis, content building and engagement. Fee covers all material. Light lunch provided. 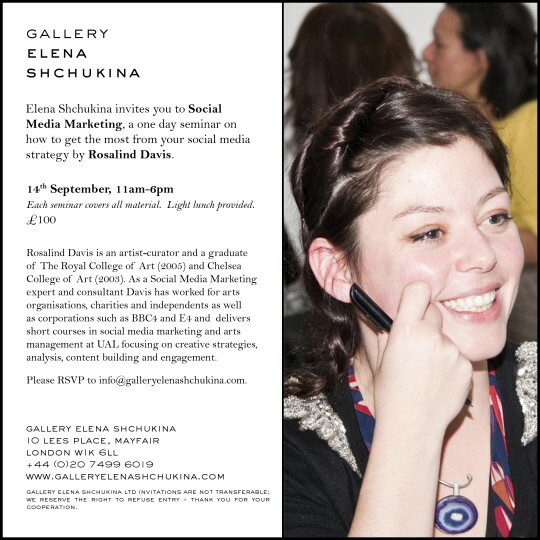 For further information and tickets contact rebecca@elenashchukina.com or click here to buy tickets for 10th October.